Robert Nathanson, classical and baroque guitarist, is an active recitalist and orchestral soloist, now focusing mostly as an ensemble performer giving concerts throughout the United States, as well as performances in Germany, Italy, the United Kingdom, Spain, Austria, Slovenia, and Canada. 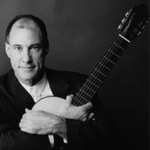 He has been performing as part of the Ryoanji Duo (guitar and saxophone) and the North Carolina Guitar Quartet since 1992 and as part of Duo Sureño (guitar and soprano) since 1999. A champion of new music, Robert has commissioned, premiered, and recorded works by David Kechley, William Neil, Jing Jing Luo, Ernesto García de León, Leo Brouwer, John Anthony Lennon, Ernesto Cordero, Marilyn Shrude, Shih-Hui Chen and others. He has hosted several New Music Festivals inviting composers and performers to the campus of University of North Carolina Wilmington, where he is Professor of Music, to perform, record and conduct master classes. He is also Artistic Director for PRO MUSICA, a concert series celebrating the music of living composers sponsored by and performed at the Cameron Art Museum in Wilmington, NC. In March 2016, Innova Records released the CD, “Sea of Stones: new guitar and saxophone music by David Kechley”, where Robert serves as both performer and producer. He has also released Images, a CD of all new music for guitar and saxophone, and At the Edge of the Body’s Night, a CD of new music for soprano, saxophone and guitar. A Liscio Recording artist (www.lisciorecordings.com), Robert has also recorded two solo CDs entitled New York Sally and Exposure.